I’ve been loving the 2009 Collectors since the day when my editorial staff tested it for our music magazine Accordo. 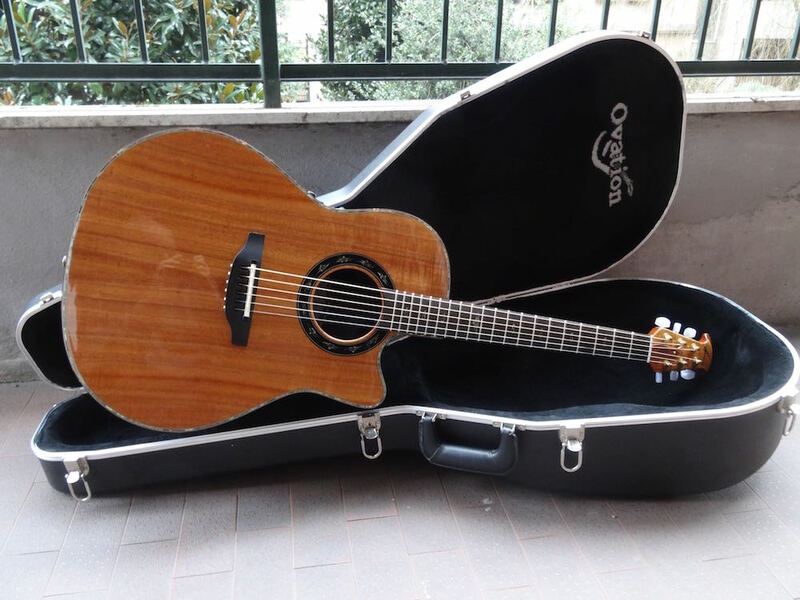 The awesome wood and the perfect ova put this limited edition guitar (150 pieces worldwide) among the best Ovation Collectors. The 2009-FKOA has a lightweight deep contour cutaway body, a hand selected figured koa top, specially designed abalone Celtic knot round soundhole rosette, tortoise/abalone top binding with over 200 pieces of abalone, ebony fingerboard, OP-Pro studio preamp, 25.5″ scale length, 1-3/4″ nut width, gold tuners with pearl buttons and a deluxe hardshell case. When I saw this beauty on Craigslist, so clean it looks virtually unplayed, I tried to find an agreement with the seller, but the guy was rough & tough: no shipping, no PayPal, no-nothing. Fortunately I have some good friends in the USA guitar business and they bought the guitar for me (thank you Suzy). Soundwise, this Fender-era Ovation sounded good just out of the case, although it came stringed with the infamous Elixirs. After a setup and with a fresh set of Martin Phosphor Bronze light the koa top started producing the cleanest and most sparkling sound of all my wood-top Ovations. The 2009-FKOA is not a powerful guitar, but it’s high edged sound is perfect for strumming rhythms. I was expecting a beautiful guitar, I received a beautiful guitar that sounds great.